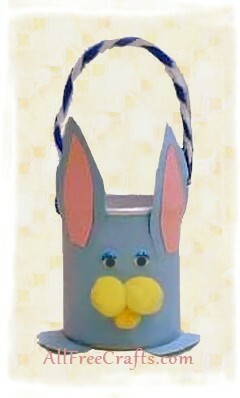 An Easter craft for children, showing how to make an Easter bunny from a small recycled Pringles potato can. 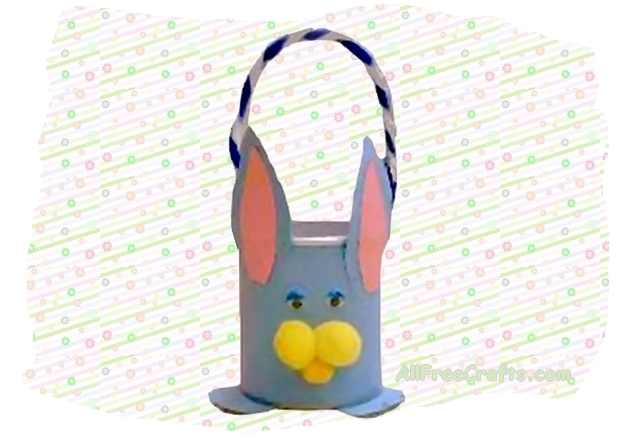 The finished bunny can be used as a basket for your Easter treats. Here is a quick and easy little basket that the kids can make. The required supplies are few and the cost minimal. My sister made this little fellow for her 6 year old son and he thinks it’s “very cool”. For small children you will need to cut the paper for them, but older kids should be able to manage on their own. Cut a piece of paper to fit the outside of the can you are using. Cut two ear shapes and two bunny feet, all from the same colour. Using another colour of paper, cut out the centres of the bunny’s ears. Glue the paper around the can, as shown in our sample photo, to cover any markings on the can. Glue the ears to front, feet to the bottom, ear centres and eyes to the face area. Glue two pompoms side by side for the nose, with a third smaller pompom to centre bottom of the first two pompoms. The handle is made using two chenille stems (one blue and one white), twisted together. To attach the handle, punch a hole through the sides of the can and twist the ends of the stems to secure.